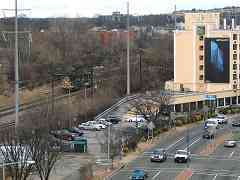 It's quiet here, however as we'll see that changes past the bend and the Queens Chapel Road overpass in the distance. Prior to 1907 and the opening of Union Station, the B&O's Washington Branch track did not have this gentle curve. 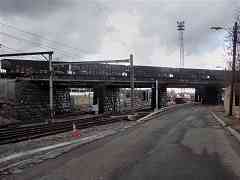 Instead the track continued straight, and ran along what is now West Virigina avenue. 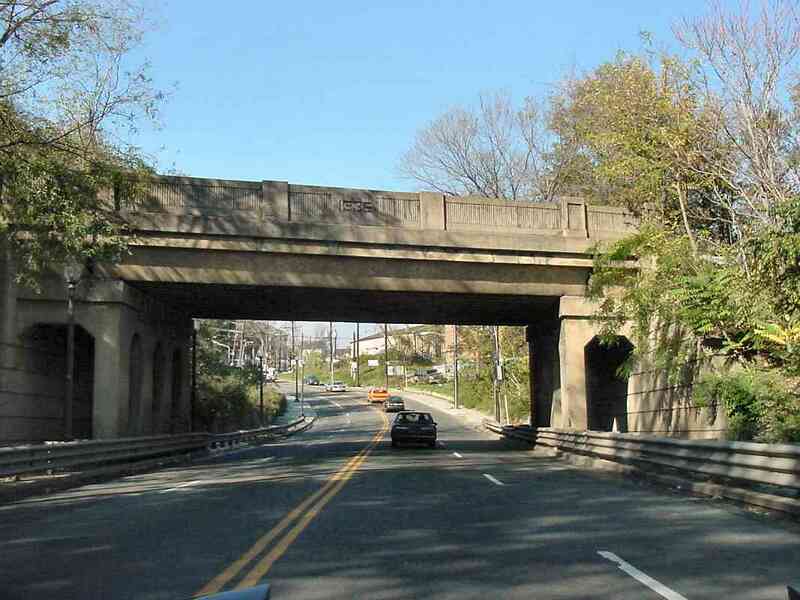 With New York Avenue a short distance behind, this 1936-dated bridge carries the B&O over Montana Avenue on its way to train Yards (left). Immediately behind me is the Pennsylvania Railroad's bridge, which serves the same purpose, but is not nearly as attractive looking. 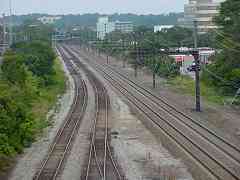 Prior to the Union Station track realignment, the B&O had a small station named Montello near this location. Readers have asked if this bridge west of Montana Avemue and over New York Avenue is former B&O. No, it belonged to the Pennsylvania Railroad to serve various businesses along the south side of New York Aveue, including Hecht Company. 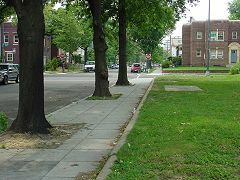 When the B&O's pre-Union Station route followed what is now West Virginia Avenue its tracks crossed left to right near the intersection of what later became New York and Montana Avenues, the intersection this auto traffic is waiting to cross. "Many years ago (1980?) 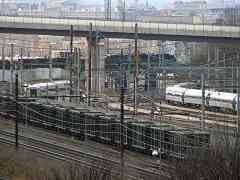 I remember seeing a Penn Central SW switcher sitting on that bridge with a number of box cars. On checking on line satellite pictures confirms that the line connected with the PC. To get to the B&O it would have to cross The Amtrak main line at grade. As always keep up the good work on an excellent site." Short portions of the Pennsy spur track can still be found. 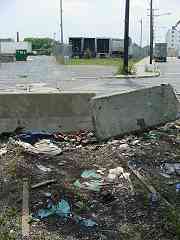 At photo time trucks (as seen in the background) did the transport job, while the tracks are left to accumulate trash. That's Okie Street on the right. During the 2010s this area was redeveloped into mixed use. 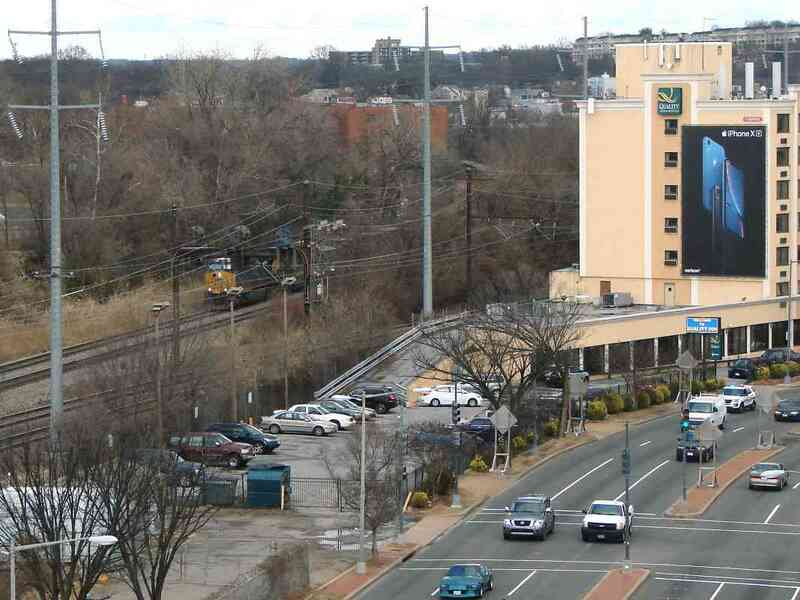 Behind the Quality Inn near New York Avenue and 16th Street the former railroad foes joined to begin sharing the route into downtown; for MARC commuters the two lines go by the named Camden and Penn. Emerging from behind the motel on the Camden Line is CSX 3061 in "Rock Runner" duty. As you might reason, "rock runner" is a generic name for a train that rolls crushed stone from mines to various distribution points. Initially the B&O had a monopoly on railroad service to Washington, but eventually the Pennsy muscled in. Each RR had its own station, making the downtown area and Mall busy with steam engines, unsightly steam engines according to the politicians. 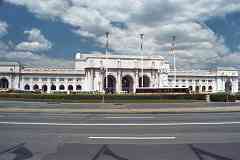 In 1900 they "encouraged" the railroads to build a single, joint station, and in 1907 Union Station opened. Both the B&O and Pennsy constructed new approaches to the station, and for the next 3 or so miles the tracks of the two competitors run adjacent. The Rock Runner illustrates CSX's route through Ivy City, now dominated by Amtrak, MARC, and the Washington, DC Metro. This train is not bound for DC, but rather CSX's Metropolitan Subdivision where it can continue into the hills for a stone refill. 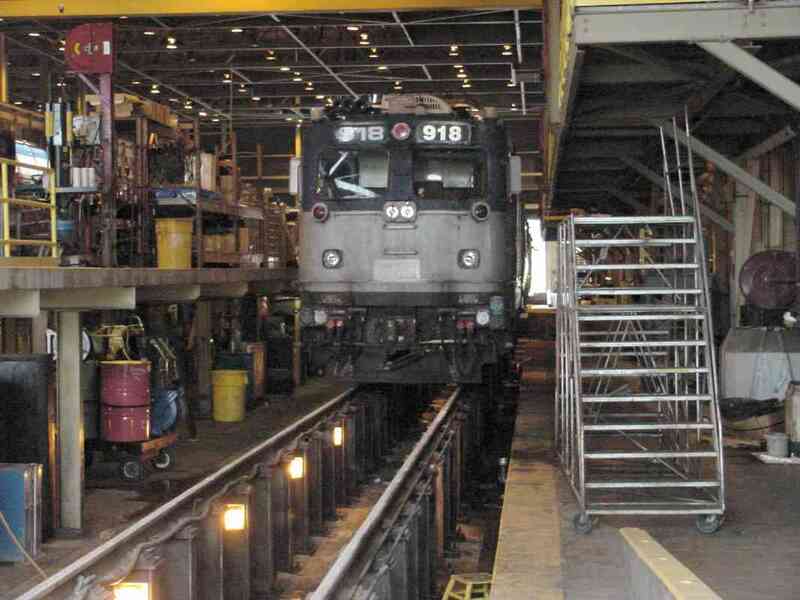 Union Station created the need for railroad support, such as repair shops. Ivy City Yard still serves in that capacity. 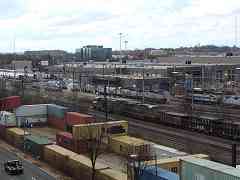 The containers adjacent New York Avenue at bottom left are part of "Hecht Town", essentially a publicity stunt to promote the redevelopment of the former Hecht Company warehouse on the south side of New York Avenue. 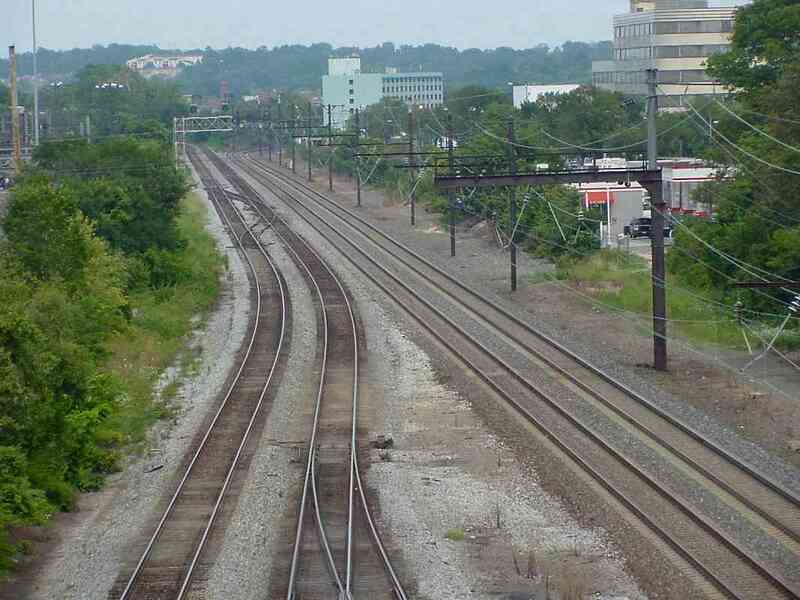 Both ends of the Rock Runner are visible as it crosses over the "waistline" of Ivy City Yard and follows Track 1 toward the CSX Metropolitan Subdivision. 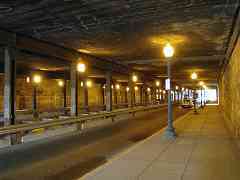 That's 9th Street spanning overhead. The uncooperative (for railfanning) 9th Street overpass provides an overhead look back about a mile to where Montello Station had been. 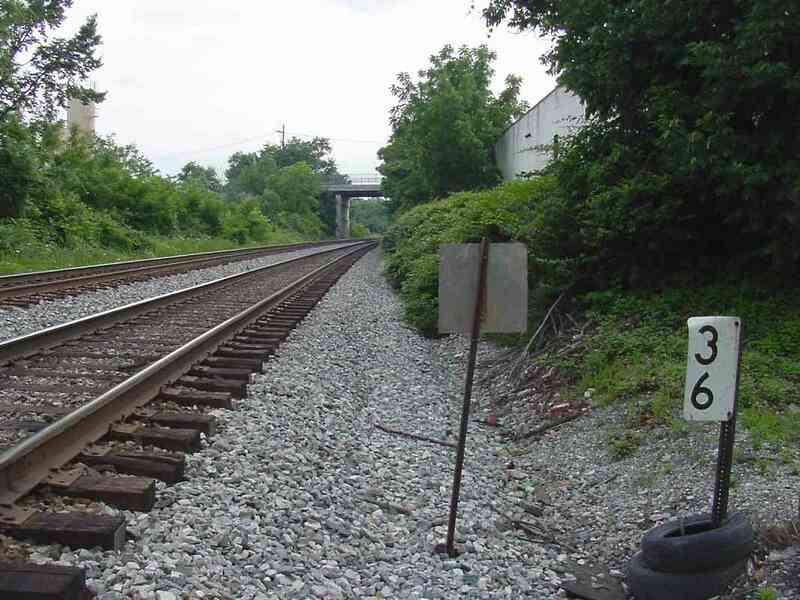 In this reverse view the ex-B&O (now CSX) tracks are on the left and the electrified ex-Pennsylvania RR tracks (now Amtrak) are on the right. 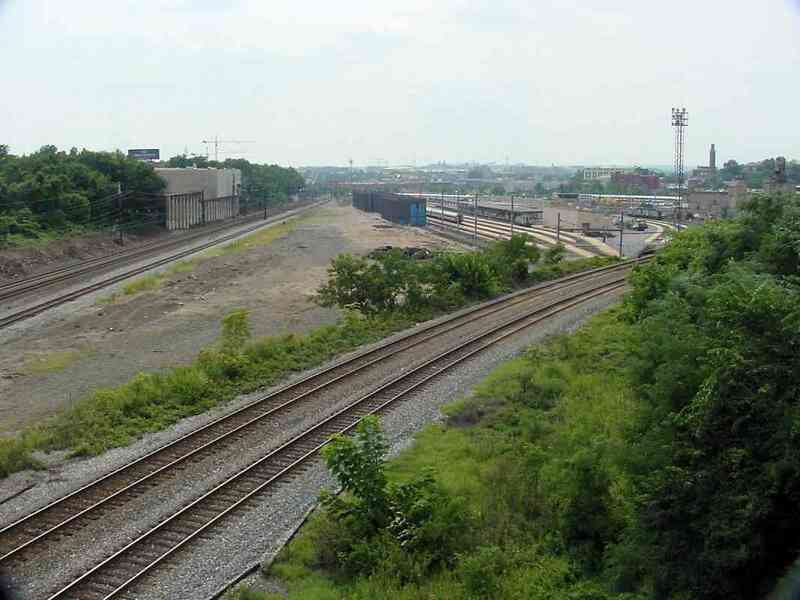 At the bottom of the photo, note the pair of ex-B&O tracks bends to the left: they are part of the large wye that now connects with CSX's Metropolitan Subdivision. 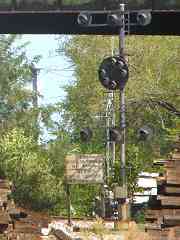 The switch at the bottom leads a single track into Union Station. The B&O's F tower had been here on the left; on page 232 of Impossible Challenge II it can be seen in a photo similar to this that dates from the 1940s. 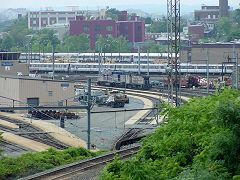 Prior to the realignment, the B&O's right of way had continued across what has become New York Avenue, passing close to the tall office building seen on the right. 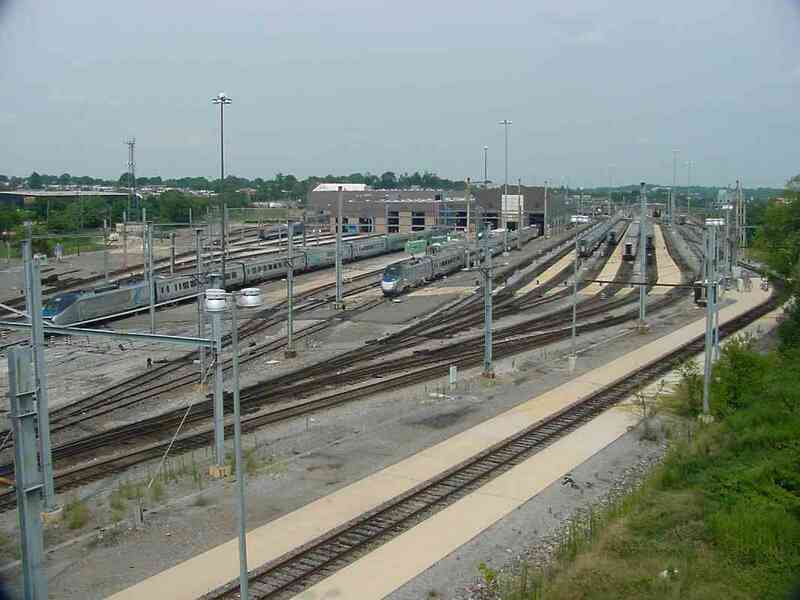 Amtrak's Ivy City repair center is north (left) of the joint RoW. Though this is not a former B&O operation, the yard is significant enough to warrant the next few photos. 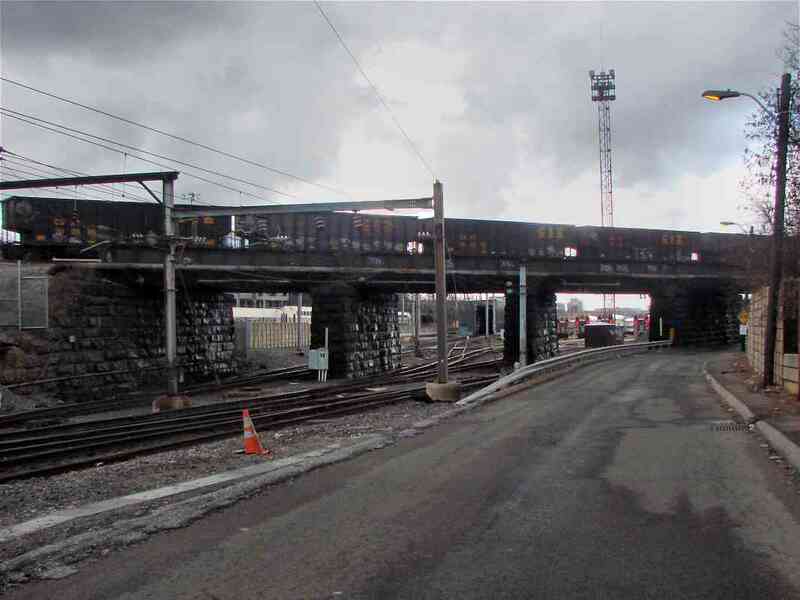 The 9th Street overpass offers enough views to make any railfan's mouth water, but there is a reason this area is called the "holy grail of railfanning". Lots of trains, yes, but no place to park, a rough neighborhood, and if that wasn't enough, a once anthrax-contaminated post office (yes, this is where you can find the infamous Brentwood Postal Facility). 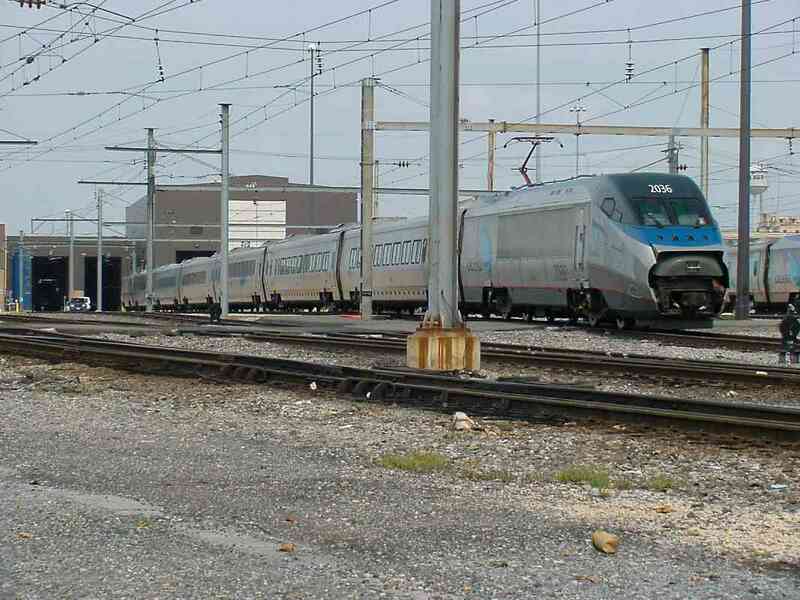 From trackside it looks like Amtrak Acela 2036 has a sore nose. This is the same train seen at the extreme left of the prior photo. AMTK 918 gets reinvigorated at the train spa. 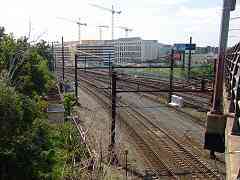 The dual PRR tracks are on the left, along with the single B&O track to Union Station. Below is the wye track that connects to the Metropolitan Branch. 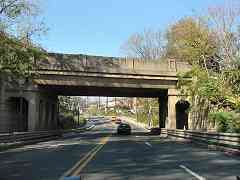 The 1873-opened Met extends from Washington north-northwest through Rockville and Gaithersburg to meet the Old Main Line at Point of Rocks, Maryland. The two photos below zoom into the picture, first to the left, then to the right. Ahead the tracks bend toward Union Station. That's the top of the Washington Monument at the extreme left. 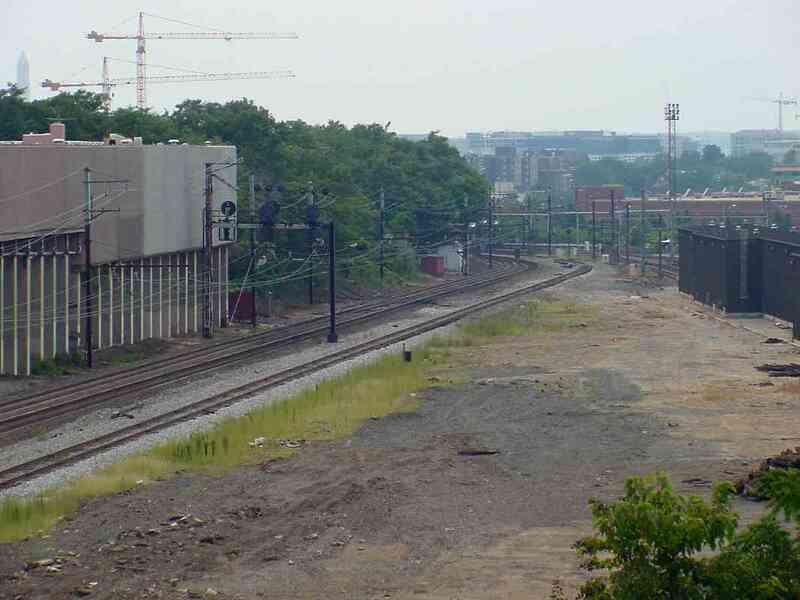 Eckington Yards, the B&O's primary freight facility in the DC area had been located just west of here, but in 1976 some of the property was transferred to the then new DC Metro subway and combined with Pullman Yards to become their Brentwood Shops. 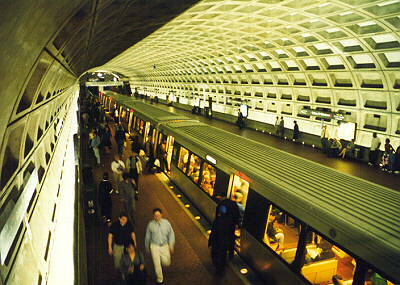 In the distance are several rows of Metro cars. 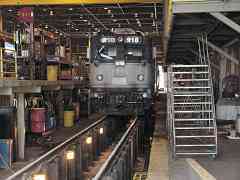 "Eckington was still in service by the B&O in 1976 and NO part of it was ever transferred or used by WMATA. The only yard used to build Brentwood was the old Pullman yard and it was completely built and in service by 1976, along with the first segment of the Red Line. So, the only thing that happened in 1976 relative to Brentwood was that the Metro line here opened for service. 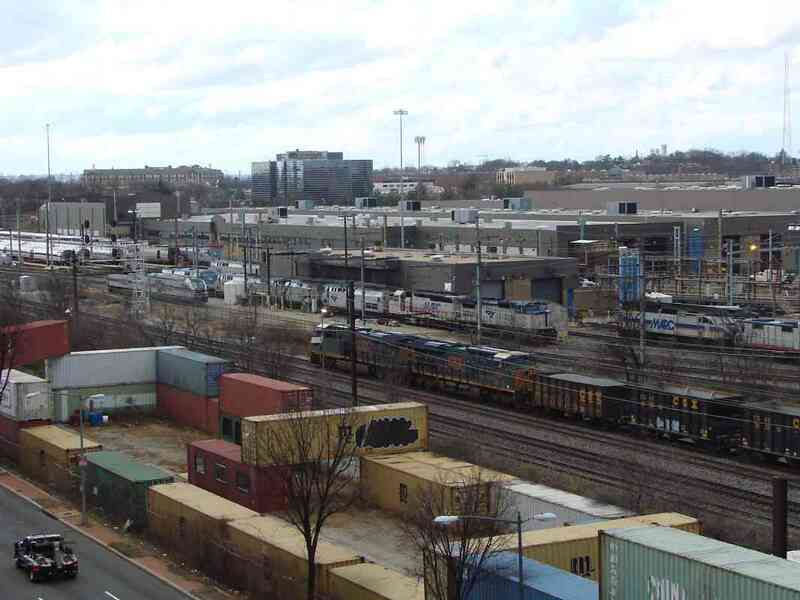 In the photo you shot from the 9th St. bridge, Eckington would be between the Metro cars and that red brick warehouse in the center of the shot. 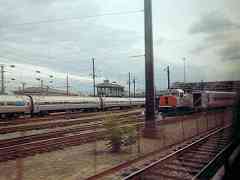 The piggyback yard extended perpendicular to the main yard tracks and was off to the left." 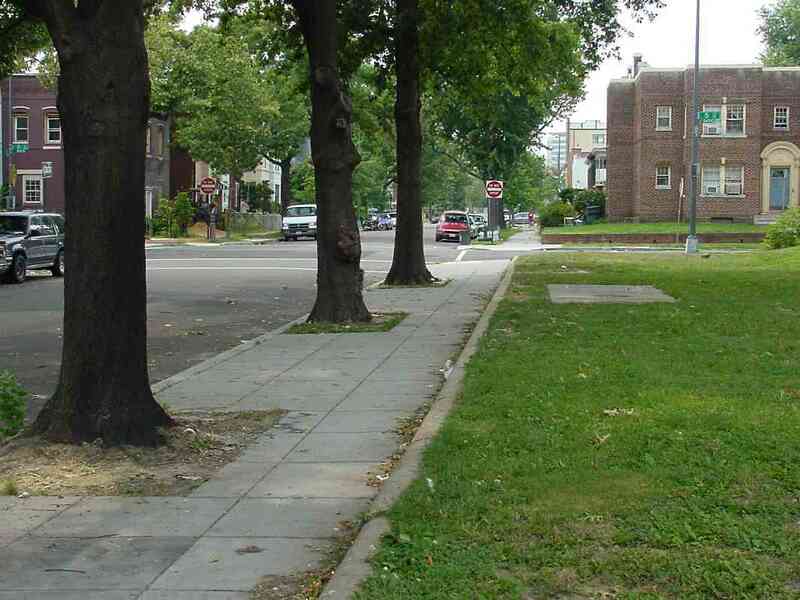 "Eckington was the estate of prominent journalist, and D.C. mayor, Joseph Gales. During the Civil War it was the site of a Union Army hospital." Washington Terminal Company livery makes this rebuilt SW1000R stand out as it rolls under 9th Street. 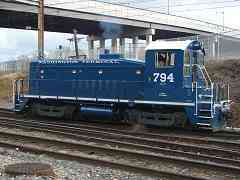 Built in 1953, in a previous life "WATC 794" was Montour 83. 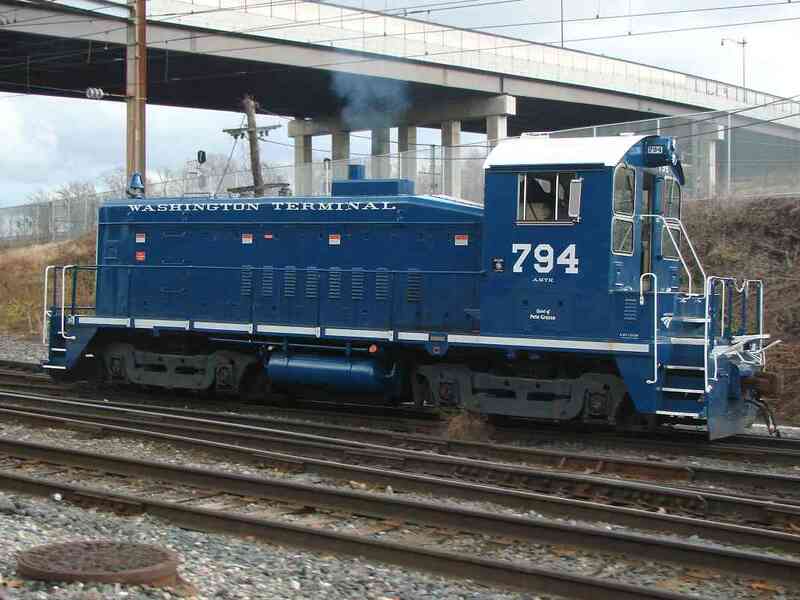 Washington Terminal Company is almost wholly owned by Amtrak. It's job is to push and pull rail equipment around Union Station. CSX coal empties are traversing the ex-B&O bridge at the "waistline" of Ivy City. This sign under the 9th Street bridge reveals where along the wye CSX places the boundary between the Cap and Met: for eastbound trains "End Metropolitan Subdivision BA M.P. - 1.0, Begin Capital Subdivision M.P. BAA - 37.2". 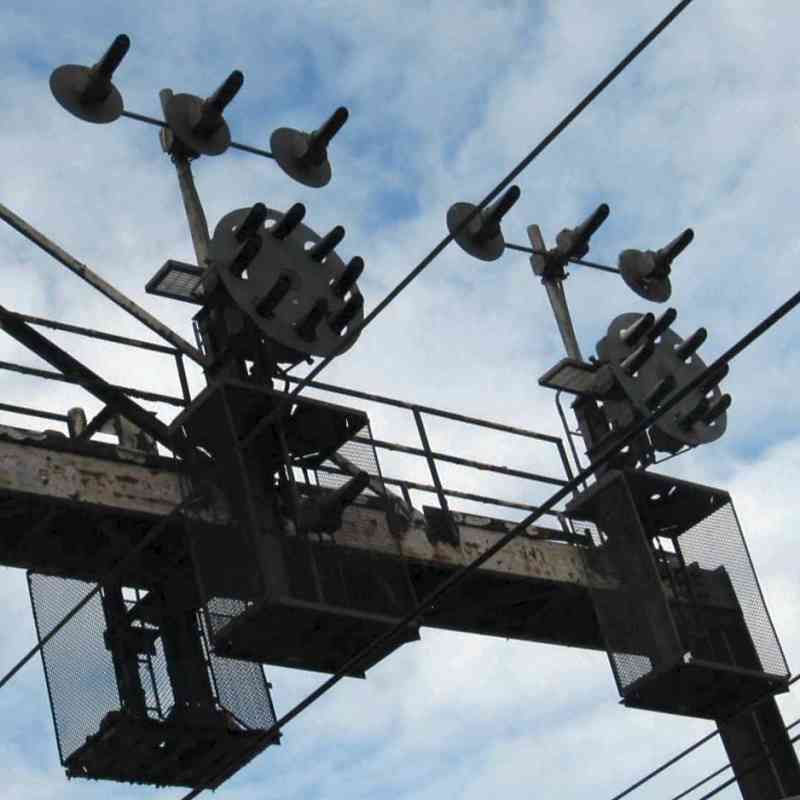 Since photo time, CSX replaced the CPL signal in the photo with one of its newer design. When Union Station opened, around 1908 the B&O abandoned its original route in favor of its new approach into the Station. The old alignment was repurposed into West Virginia Avenue. Continuing into Washington via West Virginia Avenue yields little evidence the railroad had once been here. I had hoped to find one of the B&O's stone mile markers surviving in someone's front yard, but no such luck. Mile marker 37 would have been at the Mt. Olivet Road intersection seen here. 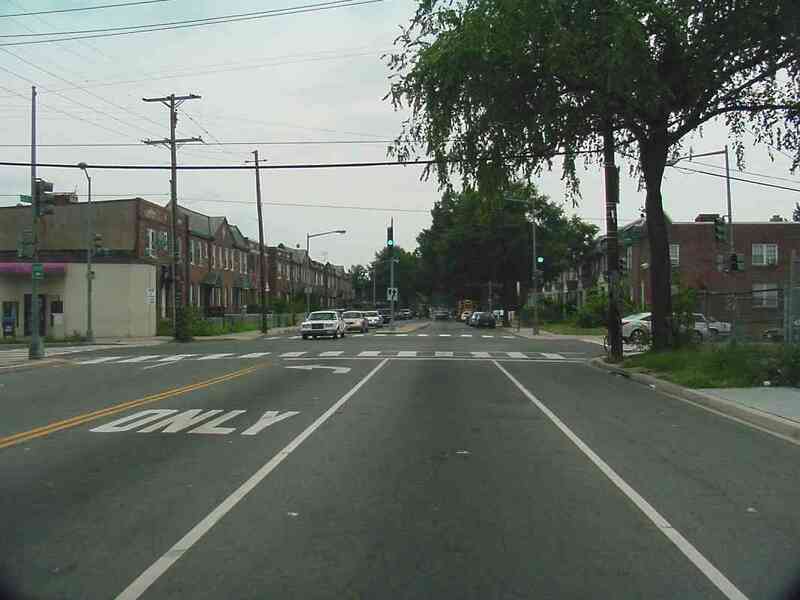 The same markerless situation exists at I and 5th Streets NE. This had been mile 38. 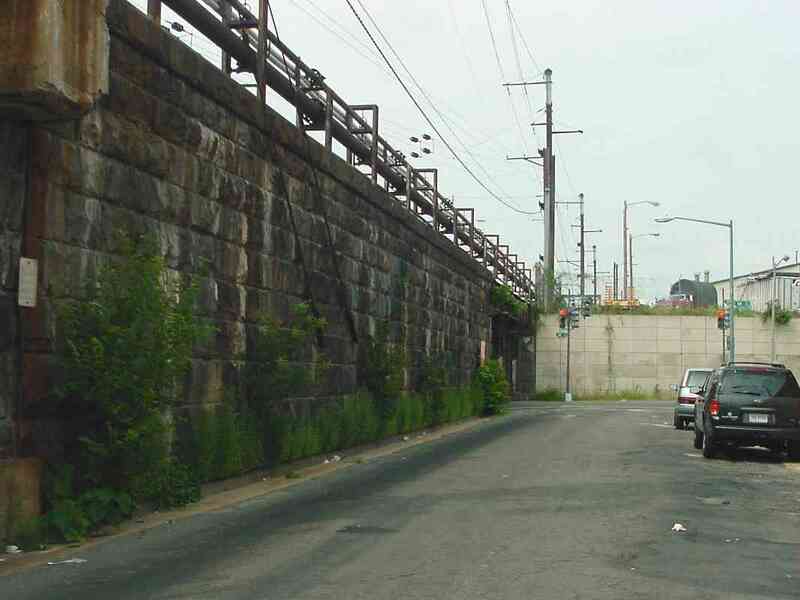 From here the original route curved southwest (left) as it made its way about a mile into the distance to the B&O's station at New Jersey Avenue and C Street. Before that station opened in 1851, the B&O had only a small station it converted from a boardinghouse at Pennsylvania Avenue and 2nd Street NW (presently near the Capitol Reflecting Pool). All traces of both stations are long gone. 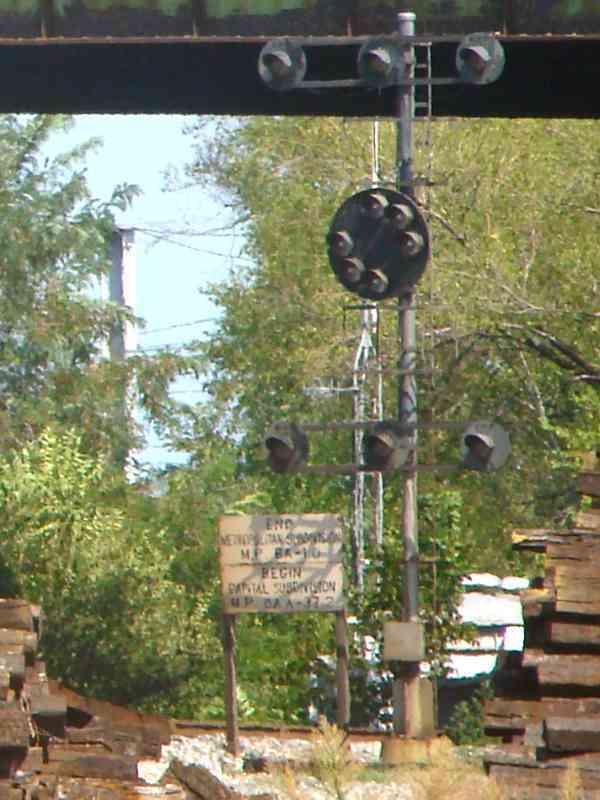 The signals facing this direction are of ordinary Pennsylvania RR style, but those opposite are B&O-style CPLs custom crafted from PRR signal parts (view at left courtesy Todd Sestero). 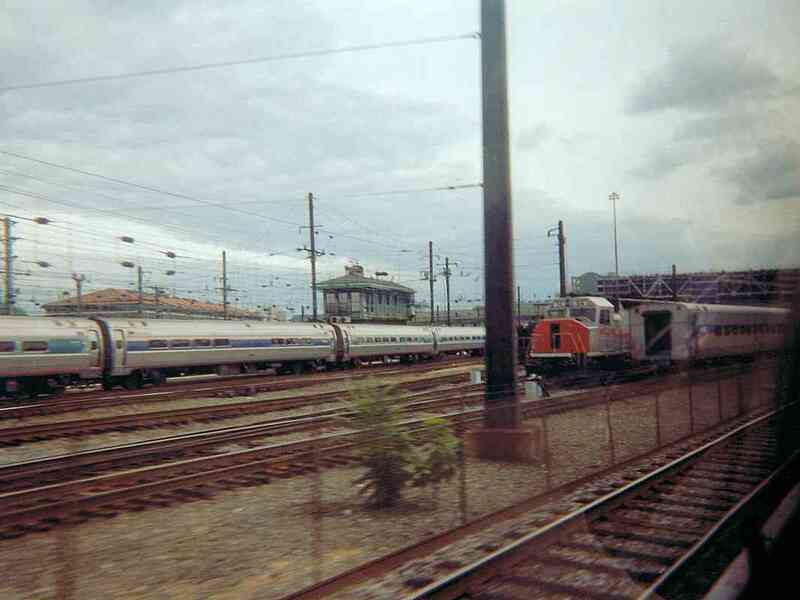 This interesting, perhaps unique, combination arose from the shared route into Union Station. 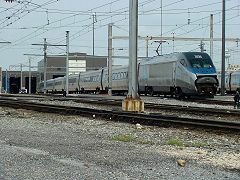 Though the two closest tracks are ex-PRR, now Amtrak, B&O/MARC trains are sometimes switched onto them to facilitate access to all passenger platforms at Union Station. Note also there are 2 tracks under the signals, but the signals are shifted to one side rather than being back to back. This was a common PRR practice ostensibly to make the signals more visually associated with their corresponding track. That's the 9th Street bridge in the background. 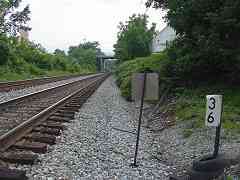 The Penn Line and Cap Sub tracks are the three nearest. 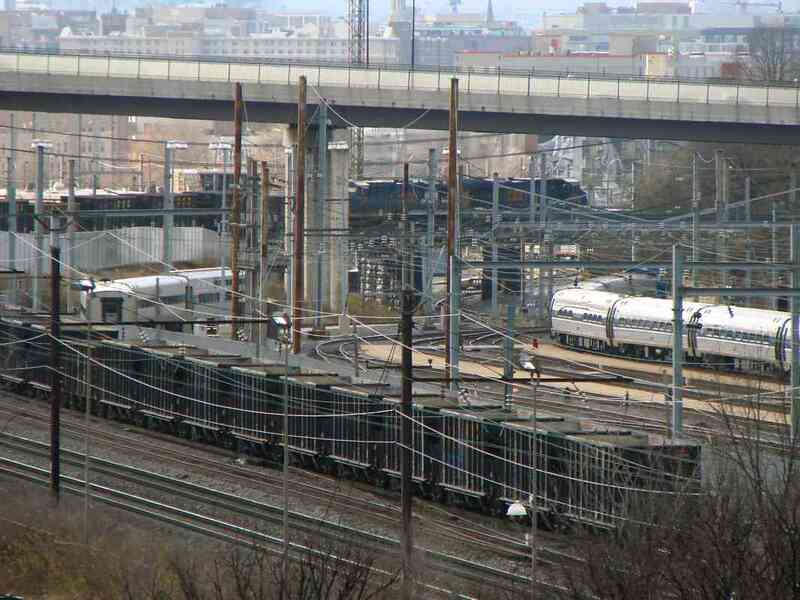 The others lead behind the photographer to Amtrak's Coach Yard at Ivy City, CSX's Metropolitan Sub, and DC Metro's Red Line. 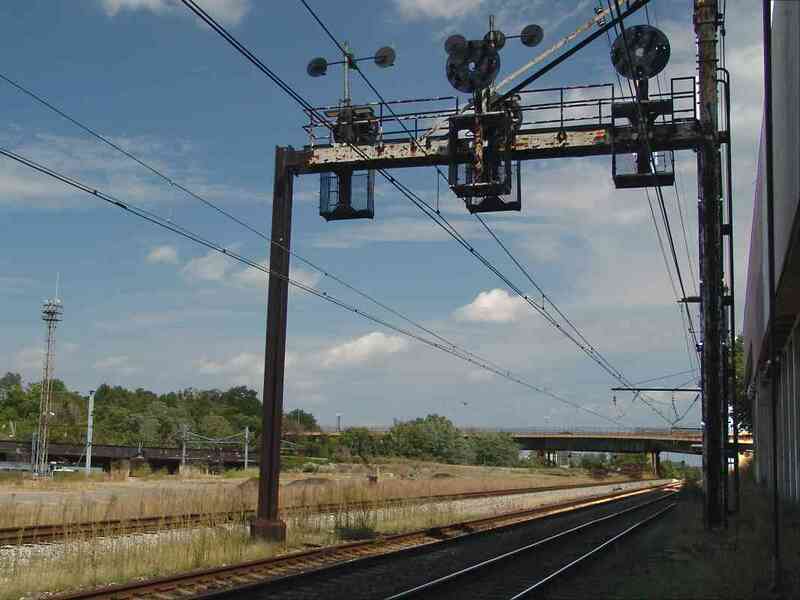 Note the verdigrised ground wires attached to the road's fence, perhaps due to the proximity of catenary. 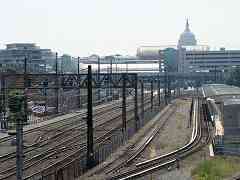 The western trackside provides the first glimpse of the Capitol. On the signal bridge at left note the small CPLs, Union Station Terminal's own variant of the B&O and PRR editions. 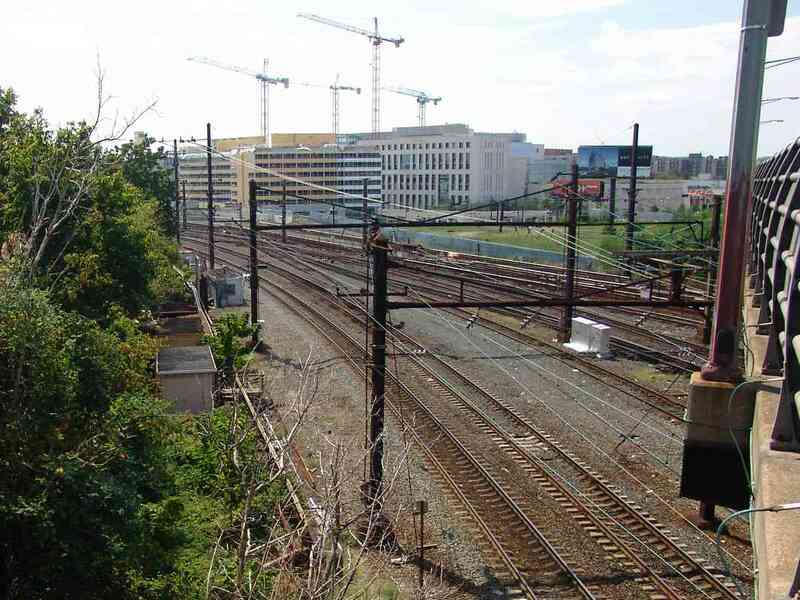 On the right is Metro's NoMa�Gallaudet U stop, the system's first infill station; NoMA = North of Massachusetts Avenue. The distant tall structures this side of the Capitol belong to Union Station. Now we're looking north with Union Station behind. 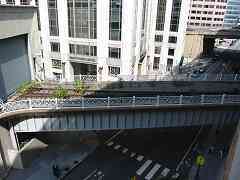 The tracks were built on an embankment, and most city streets, like M Street ahead, cross under. Underneath is a combination of stone, steel, and modern concrete. Since the time of this photo, only the center remains open to automobile traffic. What happens when you snap a photo with a disposable film camera (remember those?) through the window of a moving Metro train? You get a poor quality picture... I don't ride Metro often, and this is the only photo I've taken that shows K Tower, the spot from which all train movement at Washington Terminal is directed. Back when cameras struck less fear into authorities, the backyard of Union Station was more accessible. It's where Maryland Area Regional Commuter engine 4900 relaxed awaiting evening commuters. 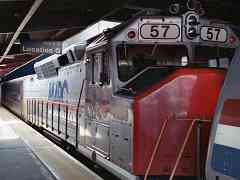 You'll note this train is not headed by a diesel locomotive. 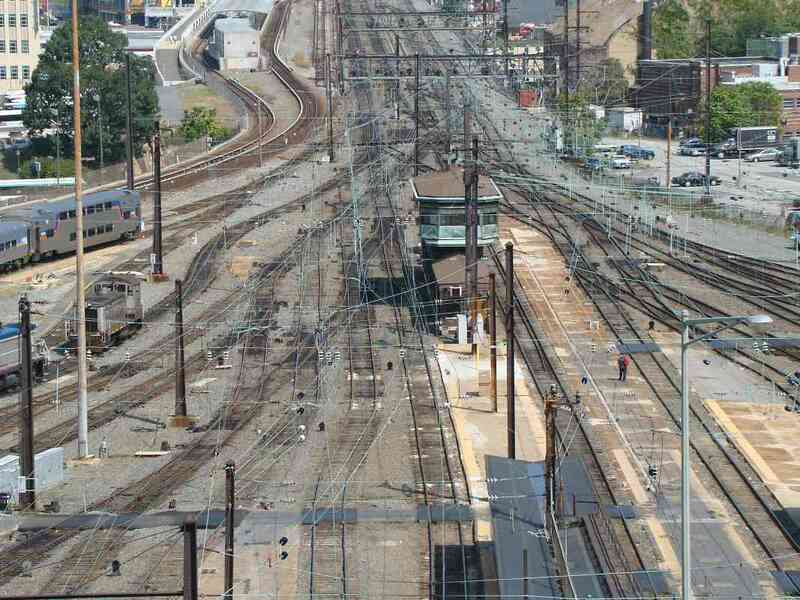 After leaving the station, it will split off from the shared RoW, and follow the former Pennsylvania RR route (now the electrified Northeast Corridor) north toward Baltimore. 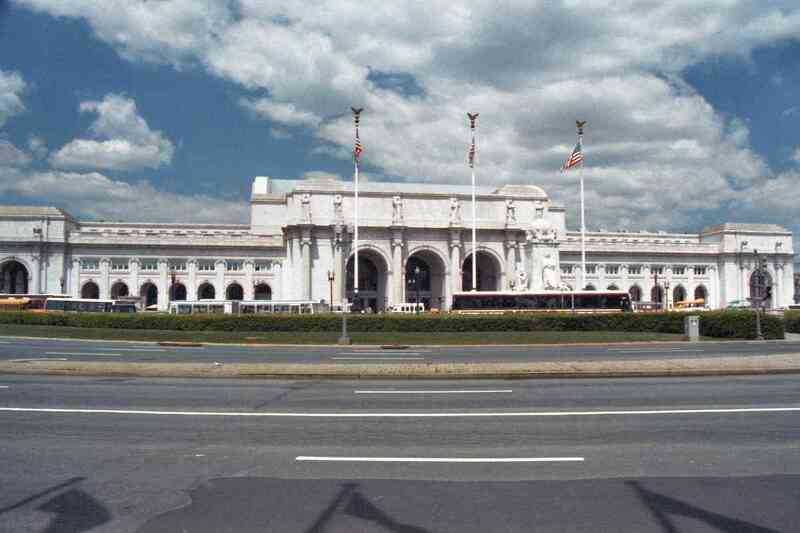 During January 1953, Pennsylvania RR's runaway "Federal Express" train roared through here and rammed into Union Station, just days before crowds were expected for a Presidential inauguration. Tough to believe this complex track layout is simpler than it was 100 years ago... one of the old photos below was snapped from roughly the same location. That's K Tower near the center. 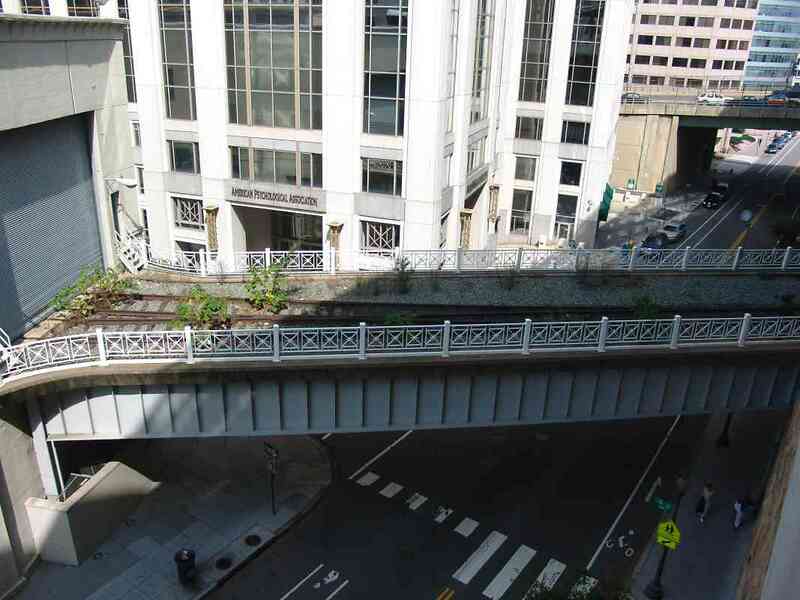 This long-disused elevated spur at First and G Streets had connected Union Station (right) with the Government Printing Office (left). Paper by the trainload could be delivered directly into the GPO without any street running. Awaiting in the bowels of Union Station for homeward bound, weary commuters are several MARC trains parked nose to tail. This is MARC locomotive 57 pointing the way to the suburbs in Maryland. 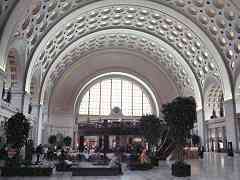 This is the view inside Union Station. The main entrance in is on the right side, with ticketing and trains to the left. Perhaps the honeycomb ceiling design found here served as the inspiration for that in DC Metro subway stations. 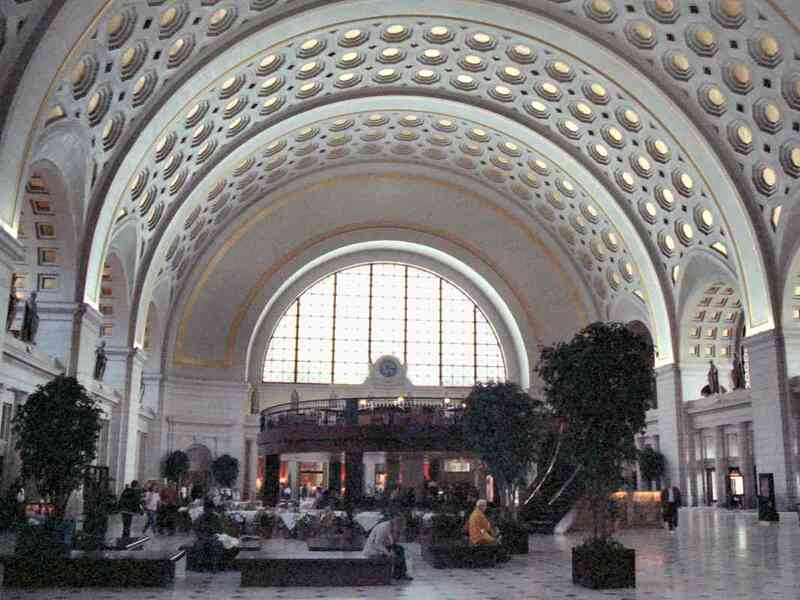 Union Station in Washington, DC is the end of the line for B&O's Washington Branch. After years of neglect, the station was restored to its original glory. Fortunately, the grand structure was recognized for its place in history before it could be demolished and replaced. 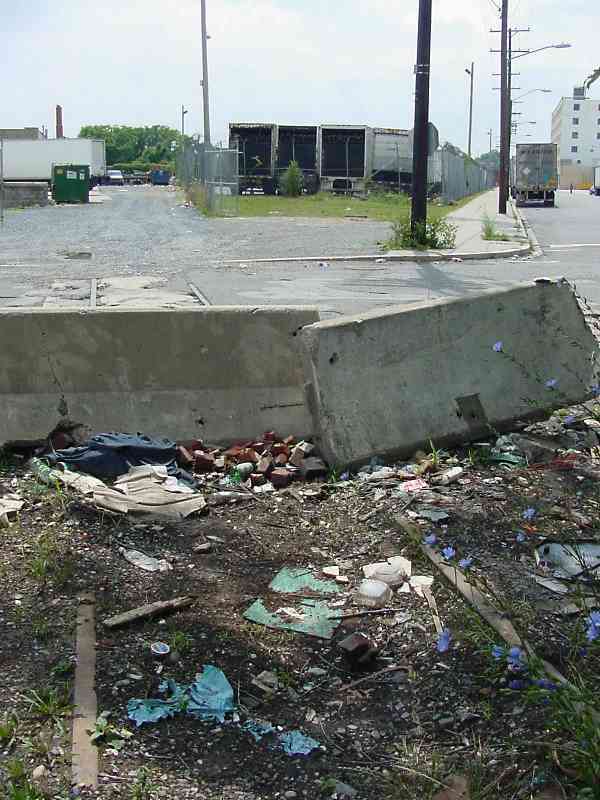 This was where the Pennsylvania Railroad, Baltimore and Ohio Railroad,Southern Railway and others met to exchange passengers in the heyday of rail travel. These days, it remains an important station for train travel. The stone mile markers along the route indicate the distance between Baltimore and Washington is 40 miles. So, why, you may ask does this site list Union Station at mile 39? The source of the one-mile discrepancy remains uncertain. Even adjusting for the location of the B&O's original station (pre-Union Station) does not account for the difference. Though the Washington Branch and this tour end here, you can continue west along the Metropolitan Branch. Return to main page for other tours.